The Killer B's Are Coming! The greatest wine regions in the world happen to begin with the letter "B," and with spring upon us, we're going to have fun with these Killer Bs and turn this coming Thursday evening into a special tasting that features the great wines of Italy and France. Come join the Hoosier Wine Guy on Thursday, April 28th at 6:30 as he will be taking you on a tasting journey from Italy’s “King of Wines”, Barolo to France’s iconic Bordeaux. This really is a premium tasting treat! In addition to premium wines from the above 4 reds, there will be a surprise or two. This tasting party is designed for the lovers of “Big Reds”. The price is $50.00 per person. There will be at least 5 wines for this tasting with the price range per bottle being $50-$100. As always, seating is limited and this is a prepaid event. Contact Carrera Wine Cellar today to reserve your spot. Plan to arrive early and be prepared to learn and taste some great wines. These are very tempting wines! So tempting that the Hoosier Wine Guy may start sneaking a sip or two early! 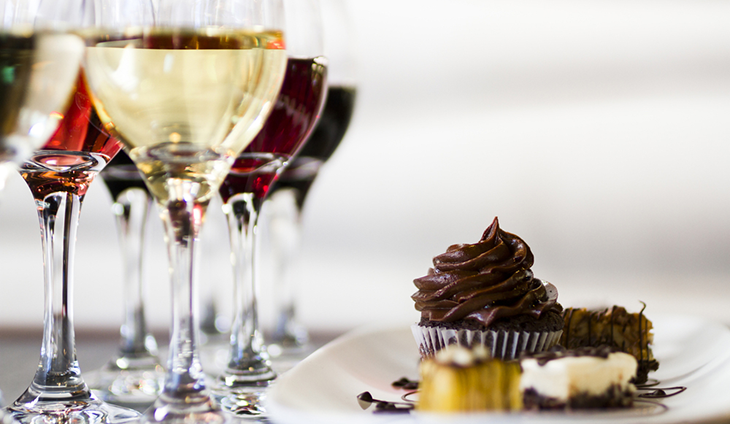 Please join us Thursday, April 7th at 6:30 pm for cupcakes and wine pairing. Carrera Wine Cellar will be teaming up with Luli’s cupcakes to pair five wines with five cupcakes. Carrera Wine Cellar’s own Hoosier Wine Guy and a representative from Luli’s Cupcakes will share in the duties for this fun and tasteful presentation. Luli’s will be providing the details behind each cupcake and the Hoosier Wine Guy will explain each of the wines. You do not want to miss out on this one! Cost is $30 per person. As always, seating is limited and our classes have been selling out. Call and reserve your spot today. This is a prepaid event. Our only hope is that we can keep the Hoosier Wine Guy out of the cupcakes until this great event starts! Wine lovers often use the term decanting interchangeably with aeration, when in truth, they are markedly different steps. Aeration is a method of bringing your wine in contact with oxygen. Most often people like to pour a young, tannic red wine out of the bottle into a separate vessel exposing it to a lot of oxygen, essentially speeding up the aging process. Decanting, on the other hand, is when you gently pour an older wine into another vessel for the purpose of separating the wine from the sediment that has collected in the bottle. Most people prefer not to find dark flakes and grains swirling around in their wine. I personally prefer to pour the older wine gently from the original bottle into the glass and skip the middle step of using a decanter. The chances of losing delicate aromas in an older vintage wine increase with each additional step you put it through. Corks serve two purposes, to keep the wine in and to keep the dirt, air, and other undesirable items out of the bottle. Cork is made from the bark of an oak tree, specifically known as Cork Oak. Cork Oak is a living thing and has flaws and imperfections which can lead to trouble. Most often these problems can be divided into three areas; taint, oxidation, and bottle variation. Taint occurs when bacteria contaminates the cork and reproduces in the bottle. Wines thus affected are said to be corked. The most common chemical compound that this interaction creates is 2-4-6 trichloroanisole, and this gives the wine its corky smell. At first, these wines become dull in flavor and the fruit taste disappears. At the next step of affliction the telltale smells emerge; typically described as the smell of a damp dirty cellar or old musty newspaper. Some people are more sensitive to the signs of corked wine than others, and some people are unaware that infected wine is really off. Fortunately, corked wine is rarely encountered. In all the wines I have consumed over the years, I have only had a corked wine once. The one time that I did have it, it was by design. It was during a wine class I attended that the instructor presented it to us so we would recognize it when we encountered it. It is not dangerous and is safe to drink. In fact, some people did not mind the taste. The vast majority of us will probably never encounter a corked wine. Wine makers are on top of the cork game. Also, more and more, synthetic corks and screw caps are being used. This is why you are seeing more wines standing up these days. Synthetic corks and screw caps are just fine in the upright position. Natural cork though, needs to be kept moist. It is best to lay these bottles on their side when storing wine long term. Many factors can shape the taste of wine. I chose five broad categories. This is a Reader’s Digest version, but if the subject interests you, you can have great fun researching the possibilities. The Grape Varietal – Here in the USA we place great value on the base grape being pressed into our juice. There are thousands of different grapes and they do not all taste the same. After the grape has been turned into wine, the basic identity of the grape can be recognized. Terroir – Terroir is a French word. There is not a really good translation in English. The best way I can describe it is how a particular region’s climate, soil, and terrain affect the taste of wine. The French place great value on terroir and will label their wines by the region. In the USA we prefer to label by the grape varietal. In most of France the terroir is considered crucial to the taste of the wine. Wine Folly has a nice simple definition of terroir for those of you that want to go a little deeper without earning a PHD! Wine Makers Choices – The decisions made by the wine makers can impact the taste. The wine maker can choose to blend multiple grapes and can choose whether to use oak barrels to age the wine. Indeed, oak barrels are often called the wine makers spice rack. When the grapes are picked matters in the final taste, as well as how the grapes are processed, and how long the wine is aged. I could go on and on. The important thing to remember is that the human interaction of the wine maker matters too. Storage and Handling – Once the juice is made, how we treat it can affect the taste. How did the wine maker store it? What did he store it in? How was it transported? How have the bottles been stored at the shop and in your home? Storage and handling can influence the taste slightly or greatly. You – I think our individual taste profiles matter. Does your tongue seek out acidity, does it highlight sugar? The makeup of your palate colors wine taste. The occasion the wine is being used for matters. Your attitude, are you happy or sad? What temperature do you drink wine at? How long do you let it set open before you drink it? These are just a few of the decisions you make to influence the taste of wine. I have heard it said that no two bottles from the same case will taste exactly alike. I think I will buy a case and try and find out! One of the most endlessly discussed topics in the wine world is the stylistic difference between "Old World Wines," primarily from France, Italy, Spain and Germany, and "New World Wines" primarily from the United States, Australia and South America. Old World wines are all about tradition and terroir. Terroir is a French word that, loosely translated, means "a sense of place". European wines are all about the soil and climate in which they are grown. Most, rather than being named for the grape variety that produces them, are named for the region, area or even village where they are produced. Hence, a Chardonnay from France might be a labeled as Chablis, a Pouilly Fuisse or a White Burgundy, or named for the village where it was produced, like Chassagne-Montrachet. Each area or region attempts to maintain its own traditional wine making style. Overall, old world wines are traditionally designed for food with lower alcohol contents, higher acidity and less forward-fruit than their New World counterparts. New World wines stress their varietal heritage. So a Chardonnay from Napa Valley may be stylistically similar to one from the Hunter Valley in Australia, but dramatically different from a White Burgundy from France (also Chardonnay). Many New World winemakers train at the University of California, Davis Viticulture & Enology School, while fathers in Burgundy still train their sons to make wine from the tiny vineyard holdings that have been passed down through a dozen generations or more. Overall, New World wines tend to be riper and bolder with higher alcohol levels and more forward fruit than the European wines. America and Australia, and to a slightly lesser degree South America and South Africa, tend to make more wines that stand alone well, or as Britain's Decanter Magazine condescendingly refers to them as "cocktail wines". And, the reality is that while European tradition intends wine to be paired with food, a new generation of wine drinkers are more likely to serve Chardonnay as a cocktail before rather than with dinner. Match a California Chardonnay with a Chablis or Pouilly Fuisse from France. A California or Chilean Sauvignon Blanc with a French Sancerre or Pouilly Fume. An Australian Shiraz with a Côte Rôtie or a Saint-Joseph from the Northern Rhône Valley. A California Sangiovese with an Italian Chianti. A California or Australian Cabernet Sauvignon with a Cabernet-based French wine from Bordeaux. An Oregon Pinot Noir with a French Red Burgundy. Or, try an Australian Shiraz, Grenache, Mourvedre blend against a good Chateauneuf du Pape from France. And for even more fun taste some of the wines before you serve any food and then taste them again over dinner. Trust me, it will surprise you. Here’s some news we can use and abuse. University of Alberta researchers say studies with rats suggest that drinking red wine can be as good for the heart as an hour exercising in the gym! The compound called resveratrol is the secret. The study was published in the peer reviewed Journal of Physiology last year. Thank you Fred Tasker of the Tribune News Service for reporting this information! It seems a wine club membership could be just as healthy as a gym membership. That’s what I’m talking about! Let’s get those hearts in shape by joining a wine club, such as the Carrera Wine Cellar Wine Club! After all, your heart deserves it! Speaking of strong hearts, I was reading The Hill the other day and came across an article by Derek M. LaValler. It is titled “Fun Facts About Wine”. In it he reported “The alcohol bill for a celebration for the 55 drafters of the Constitution represented 54 bottles of Madeira, 60 bottles of Bordeaux, 8 bottles of whiskey, 22 bottles of Port, 8 bottles of hard cider, 12 beers, and 7 bowls of alcohol punch large enough that ducks could swim in them. These people must have had some strong hearts! I think I will honor the Constitution and drink more wine. It will be good for my heart and patriotic too! The Girl Scout cookies are here, making this my favorite time of the year. I get to combine two of my favorite things, Girl Scout cookies and wine. The folks behind the Vivino Wine App started this magical mystery tour and I am glad they did. You can Google their 12 pairing and follow their lead or be brave and branch out on your own. For those of you that are going to forge your own cookie pairing path, I will give you some things to keep in mind. Wine has four essential components: acidity, tannin, alcohol, and sweetness (or lack thereof). These same four components are also found in foods. So when it comes to pairing wines with various foods, the idea is to find flavor profiles that complement each other, either through contrasting elements or matching similar ones. You are basically looking for similar or opposite. I am not so sure about this one. I think a Port would be better for my taste, or maybe a good craft beer. I thought the Tagalong destroyed my precious Amarone. But then again, Amarone is a go to wine for me and I do not like to mess around with it. I would suggest an ice wine. This was a great match for me. I really like Rieslings. I have written before how versatile they are for food pairings. Touch down!!! Peanut butter and jelly fans, this is a match for you. The fruit bomb you get from the Zinfandel makes you think you are eating a PB&J. In pairing wine and Girl Scout cookies, I think less expensive wines work best. They tend to have small amounts of residual sugar and softeners. Malbec’s are a good match for several types of cookies. They seem to have just enough tannin, sugar, and acidity to be flexible. Of course, my old fried Riesling works well with many of the cookies. Good old versatile Riesling. Good luck on your journey and be sure to pop into Carrera Wine Cellar. CWC has the wines to travel with! For the month of February, the wine flight will be paired with a Girl Scout cookie. I came across a chart the other day. It ranks the countries by the per person consumption of wine. The Vatican is number one. I am not sure how they are doing it, but I do know they are kicking our behinds here in this country. It must be all those state functions or it could be all the church services. Wine is used at every mass to symbolize the blood of Christ. I sure hope it is not because of my fellow altar boys and I. We might have sneaked into the sacrificial wine from time to time, but I’m pretty sure they could not trace that. I have listed below a few countries and their ranking by bottles of wine consumed per person, per year. #57! Come on we can do better than that. Men it falls on us. The women are doing their part. The chart below puts it on us. Carrera Wine Cellar is committed to having the inventory to help us rise above 57th place. Come on in and help your country. USA! USA! USA!